I really just wanted to mess around with my new KIKO palette a little more to be honest- and especially try out the purplish hues in it. I'm not doing anything special today, but I thought why not post a little "face of the day" kind of thing again. I didn't use an excessive amount of products, everything but my powder (which is a completely broken Catrice compact- doesn't make for a pretty picture I'm afraid!) is pictured above. So apparently I'm now also one of those people who keep their trash so they can photograph it later on and stick it in a post. Is this some kind of initiation rite into the beauty blogger world? Anyways- trash hauling, here we go! Today my friend P. and I went shopping to one of Vienna's shopping malls, the Donauzentrum. It's not overly large but it has a nice selection of shops- I mostly go there because I really wanna check out what's new at the KIKO store and to visit a friend who works at Lush; but there lots of nice shops to have a look around in. I have to say, I'm a very indecisive person so shopping with me is probably pretty annoying at times, but today I even treated myself to a few things! Nah, it's not like that, but Sunday and Monday kind of turned out to be family& friends days with a lot of rolling around in the sun and swimming- it was really hot the past few days! Time flies- my second Sunday post is already here! This week, the weather was very nice and very hot in Austria, so I'm glad I was able to cut my Vienna week short by a day and get back to my hometown already on Thursday where the nights get a little cooler and where we have a little river as well as a huge barrier lake (I have no idea if this is the right expression...) for swimming- if you wanna see what it looks like there, check my Instagram! Shock horror- I forgot my iPod in my Vienna flat! 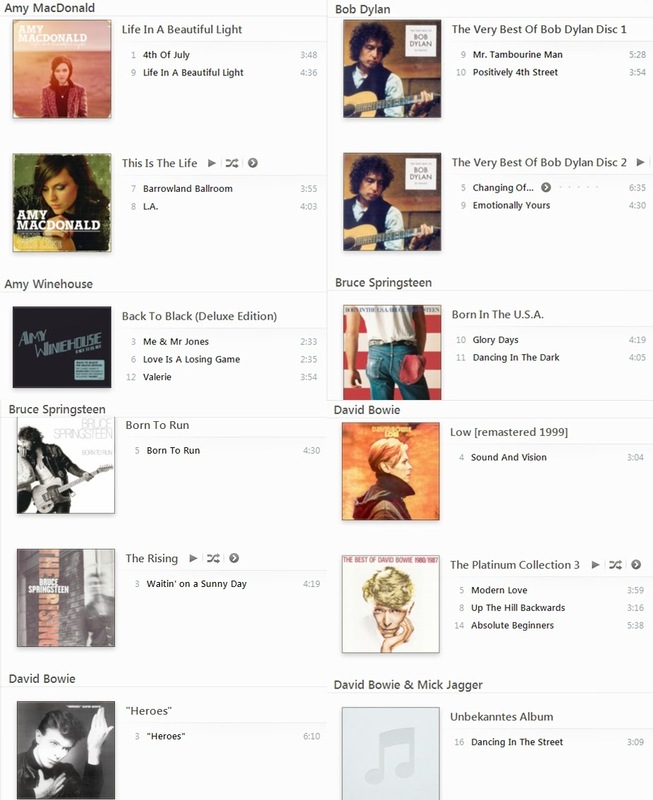 And because I am missing it so dearly right now, I thought it would be fun to create a summer playlist on iTunes for when I get back to Vienna so I can listen to my favourite tunes wherever I go. Since I'm looking like a slob today because I'm at home doing some translation work and I've spent yesterday hanging with my friends in Linz, I really have no cute makeup-y post in store for you today. So let's talk about music instead, shall we? I've been on my computer for the last two hours(-ish) translating something, but I just couldn't do that with some music in the background. So I've decided to do something "oldschool" (god that sounds stupid) and actually listen to some CDs and not turn on iTunes for a change. I still quite like buying CDs every now and then- it would be pretty pointless to not listen to them as well, right? As much as I love taking time in the morning to apply my makeup -if I have to choose, I prefer doing my makeup instead of eating breakfast 99% of the time when I have to get out of the door in 30 minutes- I equally love taking it off at the end of the day. With makeup, it's kind of the same as with taking out my contact lenses: I love them, but I'm also happy when I get to take them out. Right now, I have two favourite products for taking off my makeup: The Garnier Micellar Cleanser (6-7€) and The Body Shop Camomille Silky Cleansing Oil (13€). I start with the Cleansing Oil to remove the bulk of my makeup first; it has a really nice conistency and mixed with a little bit of water, it lathers up nicely and breaks down everything (even waterproof eyeliner or mascara) in a few seconds. After I've rinsed with water and patted my face dry with a flanel, I remove the stubborn bits left (mostly chunks of mascara) with a bit of the Garnier Micellar Cleanser é voila- clean face! In combination, these two are a pretty simple and effective way to remove makeup. Added perks are that the Camomille Cleansing Oil just smells heavenly (kind of a bit like Moringa scent the Body Shop does? Maybe that's just me.) and that the Garnier Micellar Cleanser is like a cheaper version of Bioderma (which is still hard to get old of in a lot of countries). Product Review: MAC Fluidline Brow Gelcreme "Deep Dark Brunette"
I'm obsessed with doing my brows- and I know I'm not the only one in the beauty community when it comes to that. In the last few years, bold brows increasingly became a thing again- and since I'm kind of a yeti who could easily grow a monobrow if I wanted to- I couldn't be happier about this development! My first 1 and 1/2 week of blogging is completed! I'm obviously still trying to get the hang of it all, but so far I'm really enjoying writing my own content on here. I've had blogs before in my teens, but I never really had a focus and used to just write about everything and nothing at all- I enjoyed it, but there always came a point where I kind of lost interest. So I'm really enjoying a fresh start now that I'm a few years older and actually know where my interests lie and what I want to express and share with you all. I really hope that I can establish a routine that allows me to blog (almost) daily- as an avid blog reader myself, I love nothing more than seeing a bloglovin' feed full of new posts I can scroll through and devour. I might not be reading a lot of books these days, but blogs... all the time. As I mentioned in my last post, I was at the Clam Rock festival yesterday with my dad (+ we met a friend and her parents there)- so I thought I'd post a little recap on here. Today I'm going to a small music festival with my dad, and it's in the coolest location ever- it's called Burg Clam, and it's essentially a small castle in Upper Austria. ... or makeup for lazy people who still want to look kind of put together. Don't get me wrong, I love doing my makeup and if I have to choose, I skip breakfast in order to do my makeup properly in the morning (also because I like to sleep for as long as possible...)- but sometimes a quick fix is just so convenient. First makeup-related post ahead, yay! When it comes to lipstick, there's one thing that always gets me excited, and that's a matte formula. Matte lipsticks are just so convenient- you don't have to touch them up every five minutes and they don't tend to smear across your whole face as soon as food and drinks get involved (which happens a lot since I'm basically always hungry). Normally I tend to stick with the MAC matte or even retromatte formulas, since they basically have every colour you could wish for (never enough purple though, there always could be more purple shades if you ask me...), but after I've read a number of rave reviews about the new Bourjois liquid lipsticks, I sure was intrigued. ... I'm a man of wealth and taste. So since I've been complaining for about a year after I clumsily dropped my old camera that I wanted a new one, but never really could afford buying one, my lovely lovely friends and family actually gave me a new one for my birthday last week. Funnily enough my friends now are under the impression that I have no excuse anymore to not start a blog so I can ramble on and on about makeup and music ... so here we are. First posts are always awkward (and so is this one), so how about 10 introductory facts about me and then we'll call it a day? Okay cool.